Teaching Blog Round Up: Birthday Freebies and a Clipart Giveaway! I'm not a grinch. I swear. But within my first couple of years of teaching, I decided I was tired of dealing with birthday celebrations in class. It's not that I don't like birthdays, which in fact, I do! I really do! It's just that when you're in the middle of teaching a lesson and a parent walks in with a sheet cake (which requires cutting and plates/napkins, oh and by the way do you have cups for the juice?) and the expectation that you celebrate right this minute (they have to be back to work in an hour), I sort of feel conflicted/irritated/disrespected. Even when it's figured out ahead of time, there's still a few parents who fail to let me know and do a pop-in. Anyone else? Also, there's the chance you have a student or two who do not celebrate birthdays (this was the case last year). I am not a teacher that sends a child to the hall while others eat cupcakes. And I also don't believe that basing my decision on something like that is denying other students' from their right to fun. We have plenty of celebration at school, and at this point, I think some stuff can be saved for home. So, a compromise and a solution were needed to make everyone a little more happy, including me (Remember the teacher? Oh yeah, they should have a say in these things, too!). Remember the scene in Alice in Wonderland with the "unbirthday" party? Every year within the first few weeks of school, I pick a day and in the afternoon (usually for about 45 minutes) we celebrate EVERYONE'S BIRTHDAY. I heard about another teacher doing this at another school in my district and was immediately intrigued. I tried it for the first time a few years ago, and love it. It's a blast and more importantly, the class loves it! I let the parents know ahead of time, so I can make special arrangements with a family if they do not want their child to participate. There are several kids who never have had their birthday at school (summer birth dates, parents don't have the time or $, etc. ), so this is special for them as well. Parents bring in cupcakes (I request cupcakes rather than a cake simply because they are soooo much easier to serve), drinks and some snacks. I decorate the room to make it extra special (usually just with a few streamers, tablecloths and some balloons). I put on some fun music, put out some activities (tangrams, unifix cubes, legos, puppets, coloring, etc.) and just let it be a party with nothing on the agenda but fun (which is weird feeling because the teacher in me wants to have some sort of organized activity haha!). I'd love to be super creative next year and make little gift bags, but that's just me hoping! 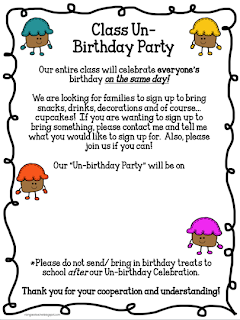 Anyway, here's a little freebie for you if you wanted to try an Unbirthday Party! 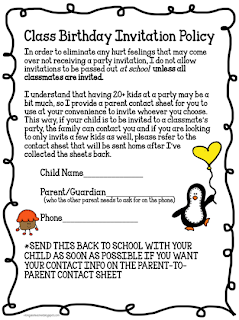 I also included a Birthday Party Invitation Policy (invite outside of school unless you invite everyone) that you might like! If you end up trying either out, please come back and let me know how it went! Click to download the Editable FREEBIE! And I'm having a Clipart giveaway! 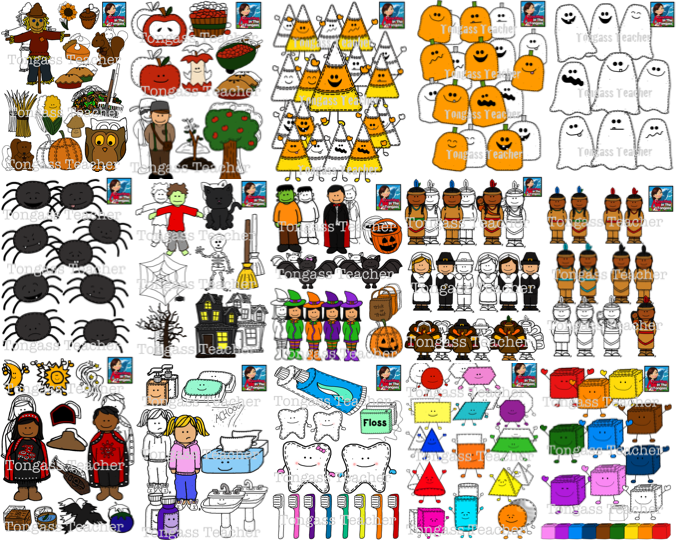 One winner will get all of my clipart bundles (that's $40 of FREE clipart)! You have 1 day left to enter!